This is one truly AMAZING street machine!!! Painted a gorgeous dark metallic maroon with custom pin stripping, this beauty just stops traffic!! 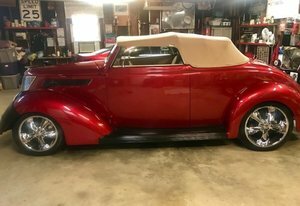 The paint and body are smoothed out with custom side skirts, the chopped convertible top is in excellent condition, and the custom polished aluminum knock off wheels lend this street rod that classic appeal. Under the hood sits a 383 cubic inch monster of a Chevy engine, with Speedmaster 2 stack electronic fuel injection utilizing FAST programming. This wicked looking combination put out a nasty 420HP and 450 ft/lbs. of torque. To say this is a beast would be an understatement!! All that giddy up and go works through a smooth shifting Turbo 350 three speed automatic transmission and onto a Ford 9 rear axle. Suspension is coil spring and short/long arm up front with leaf springs out back. Steering has been updated with a rack and pinion unit, while the brakes have been upgraded to discs with polished covers in the front. On the inside, this beauty is as comfortable as they come. Leather seats, custom carpets with floor mats, and ice cold A/C make this baby a joy to drive and cruise in. You\'ll also find custom gauges on a custom painted dashboard with polished accents, and a digital display showing real time engine operating parameters. This 36\' is as custom as they come, and it\'s sure not to last!! Hurry into our showroom today or email #####@####.### and take this show winner home today!! FEES & TAX INFORMATION - We are a licensed dealer in the State of Florida and adhere to all state and federal laws and regulations concerning the sale of a used vehicle. All applicable taxes and fees will be charged accordingly as required by the State of Florida. A fee of $495.00 will be charged to process the vehicle. Burnyzz is more than just a speed shop we Buy, Sell and Consign Classic Cars. We also have a full service department for all of your Classic and New car needs. 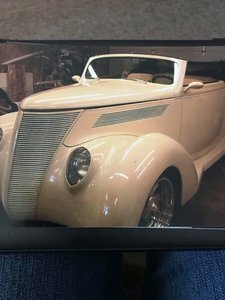 Our mission and ultimate goal is to enhance the classic car experience of our customers and to provide you and your family with a solid, classic or collectible vehicle that you can drive and enjoy for many years. We, as a team of automobile professionals, will work our hardest to see that your experience with Burnyzz is memorable and we will always respect your choice to do business with us. We strive to satisfy those individuals who have an appreciation for the history, engineering and craftsmanship of the classic car.